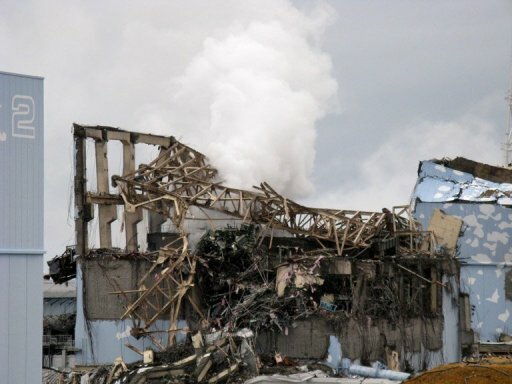 White smoke rising from the unit 3 reactor building at Fukushima nuclear power plant on March 15, 2011. Vapour has begun rising again from a reactor at the Fukushima nuclear power plant, more than two-and-a-half years after its core melted down, the site’s Japanese operator said Friday. TOKYO (AFP) – (AFP) – Vapour has begun rising again from a reactor at the Fukushima nuclear power plant, more than two-and-a-half years after its core melted down, the site’s Japanese operator said Friday. Tokyo Electric Power said it believed the steam was coming from a puddle sitting atop the reactor and was not dangerous, but it has not been able to clarify why vapour started appearing occasionally from July this year. TEPCO said the Fukushima Daiichi nuclear plant remained stable, with sensors in and around it showing no increase in levels of radioactivity being released. The steam appeared as TEPCO found more evidence that radioactive waste water at the plant was contaminating groundwater that is on its way to the sea. Thousands of tonnes of water were poured on the reactors to tame the meltdowns sparked by the March 2011 earthquake and tsunami. TEPCO says their temperature is now stable but they need to be kept cool with water to prevent them running out of control again. This is leaving the company with a large and growing amount of radioactive water in temporary storage tanks, some of which have leaked and very likely contaminated groundwater. TEPCO and Japanese officials are considering releasing some of the water into the Pacific Ocean after filtering out radioactive particles, but face opposition from fisherman and neighbouring countries. US nuclear experts, hired by the utility to offer advice, said if done properly, the release into the sea can be done safely. But the company must engage the public in meaningful ways about its plans in order to ease health and environmental worries, said Lake Barrett, a former US official who worked on the clean up of the Three Mile Island accident between 1974 and 1985. Barrett and Dale Klein, former chairman of the US Nuclear Regulatory Commission, who now leads TEPCO’s reform committee, said the water cannot stay in the tanks forever. But media portrayals of public health risks at Fukushima have been “out of proportion” and have helped generate fears over plans to sensibly deal with the water, Barrett said. Some facilities such as heavy water reactors routinely release certain radioactive materials into the environment without posing significant health risks, he said. “The water is an extremely sensitive public matter. People are rightly concerned about that. Now the levels are so low that they shouldn’t be as concerned as they are,” Barrett told a press conference. “The perceived aspects of the water far exceeds what it really is from a technological, engineering, scientific point of view,” he said. Klein and Barrett said TEPCO has been slow to inform the public what actions it was taking at Fukushima. The radioactive water spillages reported so far do not pose significant public health risks, the two men said but have weakened the public’s confidence in TEPCO. “I think from my perspective, TEPCO takes five steps forward and then two steps back. When you take those steps back, it’s very frustrating,” Klein said. “I think culturally, TEPCO and probably other companies in Japan want to know everything before they say anything. I have been trying to encourage TEPCO to be more open, quicker, earlier,” he said. The experts also suggested that TEPCO should create a subsidiary whose sole mission is to deal with the Fukushima accident, and separate it from the company’s regular power generation mission.